Do you ever feel like something isn’t right? You aren’t totally happy. You feel like a hamster in a wheel – going through the motions and trapped. You want to finally feel like you are living the life you are MEANT to live but you just can’t figure out what is missing and stopping you from achieving that ultimate joy. Perhaps you are just not meant to live according to the conventional rules. Who cares if someone says you are supposed to have a certain type of job (corporate work) to be successful? Who cares if someone says you are supposed to look a certain way to fit in to be accepted and happy? Those are their rules. Not yours! 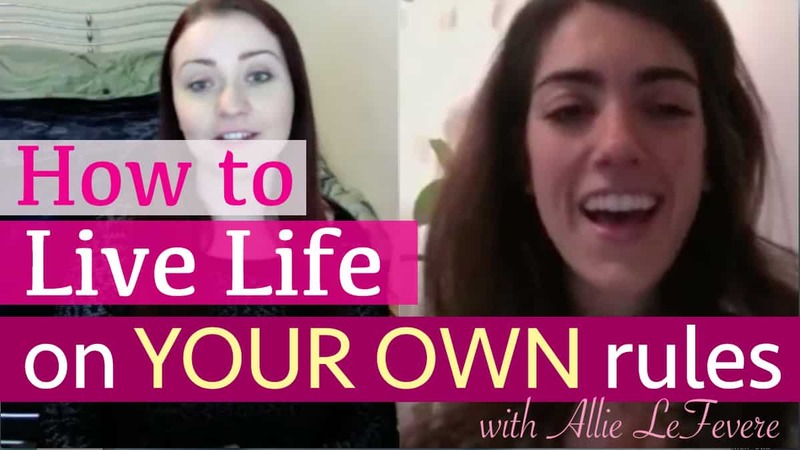 Today I had the pleasure of chatting with one of my favorite people, Allie LeFevere, a health and self-love coach based out of Chicago, about ways in which you can start living life on YOUR OWN rules so you can finally be happy and satisfied by living an amazing life. I met Allie at her first Beauty Experiment workshop in Chicago several months ago (which was super eye-opening and life-changing). This girl is full of amazing energy that just makes you want to listen – she knows her stuff! Make sure to check out her website and read the page with full list of 20 rules to live by, which is what I referred to in the video. Make sure to subscribe to her list for a weekly dose of inspiration (I love her weekly love quotes). If you are in Chicago – girl, you are in for a TREAT with her workshop, so stay tuned and I will be sure to let you know when the details for that go live. I’m totally going again just because it’s such a great time. Also – check out my post “Before you compliment someone, think about this first” which was inspired by one of the exercises we did during the Beauty Experiment. What do you think about the concept of living on your own rules? What are some of your OWN rules you live by? I love living by my own rules. That is why I work at home. I love that, go girl! Great interview! Thanks for sharing ladies! I definitely think living your life in a way that makes you happy is really important. I know I struggle with expectations but having a life that looks good on paper is not necessarily satisfying! OMG yes I can totally relate to that!! Living a life that looks fantastic from the outside and “on paper” but inside, it’s just not fulfilling… thank you for sharing! It’s about finding that out and being self-aware and doing something to change that! Love living your own rules. Better to be a great you than a sorry copy of someone else!